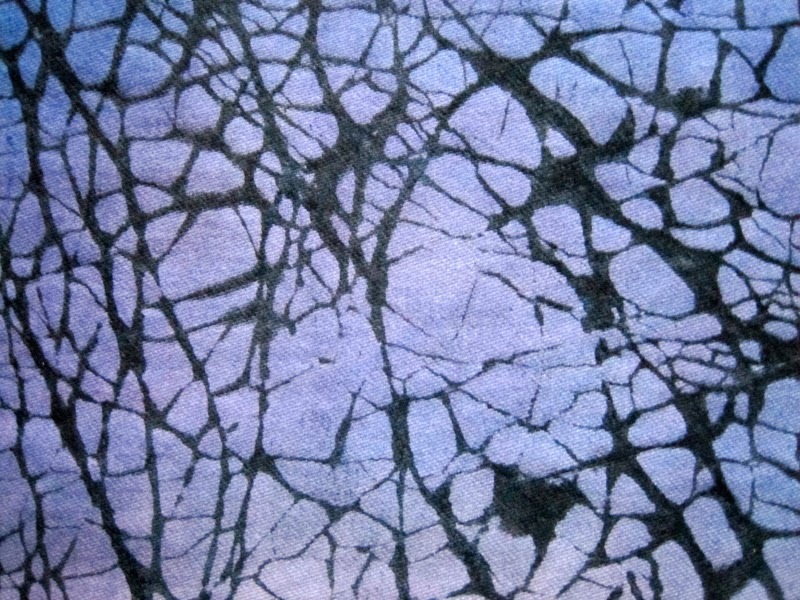 How to make a Flour-paste crackle effect. Last year I took an online course with Ineke Berlyn about making Journal Quilts, one piece for every month but with the same theme to explore, the same size and with a new technique every month. My choice of theme was "Urns" and one technique I learnt one month, was to make pattern with crackled flour paste and acrylic paint. 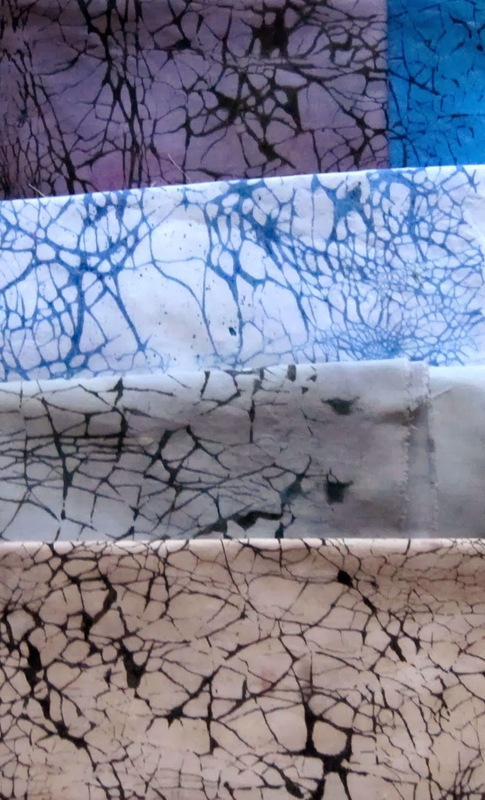 Prepare a 12" or 20 cm square of light or white cotton to make a piece of fabric with a crackle effect. Gradually mix 100 grams of strong or ordinary white bread flour with about 150 ml of water with a whisk to make a smooth, medium thick pancake of batter. Place the white fabric onto a some old newspaper and spread the batter in a thin layer over the fabric, using an old credit card or a squeegee. You can use any kind of flour. Whole wheat flour will give a coarser layer of batter and coarser crackle. When totally dry you can crackle the flour crust. Place it on a drop-cloth of plastic, flour- side up. Mix a dark acrylic paint or fabric paint with a tiny bit of water. Thoroughly rub it onto the fabric and into the crackles, use different colors if you like. Leave it to dry again, overnight. Rinse out the flour and wash.
(This can also be done with a piece of dry soda-soaked cotton fabric and procion dye paste, left to cure and wash out. I have never tested this, but I think it would be wort a trial). You will end up with an interesting textured piece of fabric. Above are some of my flour crackled fabrics. Good Luck with your crackling! (Also this year I am making JQ ́s on-line with Ineke Berlyn. The theme is chosen by her and it is landscapes. It is really very challenging and much inspiering). Ann-Mari your fabrics are lovely. Great textures, the JQ is stunning too. Thanks for the instructions I will give them a go. I tried this once before but made the mistake of drying the fabric on a very low heat in the oven, it crackled and looked good but I couldn't get the flour paste out so never tried that again! Guess the oven was the mistake. Thanks Ann-Mari. I tried this a few weeks ago, and it worked well. I did get the flour out, Margy, but it needed soaking and scraping. It still seems to feel a little stiff, but I can sew through by machine. I crackled it a bit, painted one colour, then crackled it some more and did a second colour. Worked well. Thank you, Ann-Mari! I would like to try this method! Very good tutorial, Ann-Mari. I have tried this technique too but your fabrics have much better crackle than mine so I need to try it again! Great idea, Ann-Mari! I use the crackle technique a lot in my pictorial quilts, for example, the dirt road in 'Barmah Forest', the water in 'Nathalia After the Rain' and the crayfish in 'Pinned to the Wall' (from the 'ten' challenge ACQ to be unveiled). You can also scratch in writing and gestural marks with a sate stick- you can't really make out what the marks are, as they break down, but it gives an interesting effect. I recommend 2 things to fix the problem. 1- if you over mix the flour mixture (too much stirring) you will begin to develop the gluten thereby making glue. Try not to stir your mixture any longer than is absolutely necessary. The crust will be easier to remove. 2- Use concentrated dye liquid instead of acrylic paint. Dye does not scrub off like paint does. It also produces a crisper more photo-like image. 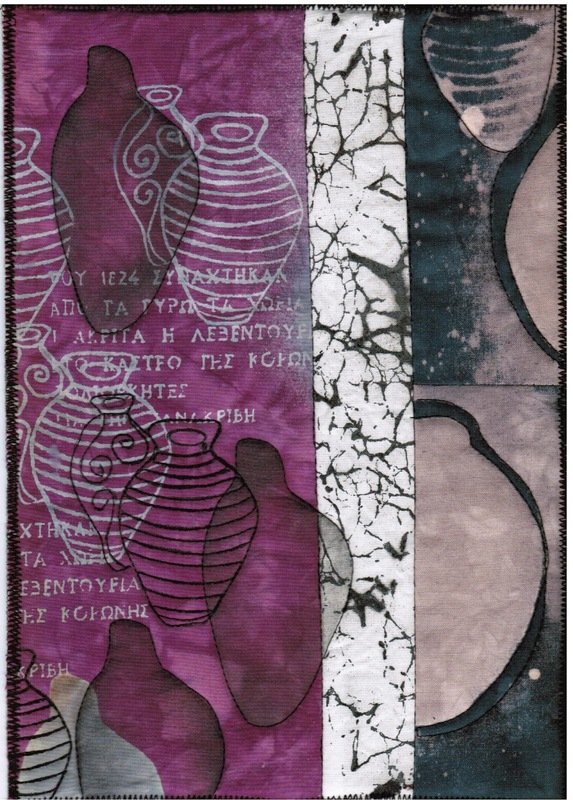 I have done this, then painted with thickened procion mx dyes. Again. It took a lot of soaking in water...for a couple of days as I remember...scrubbing a little then soaking in clean water again. Sadly I noticed Ineke passed away recently. Latitude Quilts is a group of textile artists from around the world who came together through the internet. For the past two years, 2012 -2014, we each created a 15" x 15" piece of artwork based on a common group theme. This year, 2015, we are changing the format and each member will be producing 4 quilts per year based on their own theme but each quilt will follow a challenge theme set by one of our members. Challenge themes will be a design principal or style. The results will be posted here on "Reveal Day" at the end of February, May, August and November. Each of us are enjoying exploring our art with the support and critique of other members. If only I had seen this sooner! All images, artwork, and text are the sole property of the members of Latitude Quilts. Simple theme. Theme images by gaffera. Powered by Blogger.